Voters in several Western states chose to elect candidates from both parties that support clean energy in this Tuesday's mid-term elections. These results highlight the many opportunities to enact clean energy legislation throughout the West in the coming years as supportive governors and state legislators take (or return to) office throughout the region. Advocates of a clean energy future can expect to see a number of new public policies that promote rural economic development, stable-cost energy resources and environmentally friendly renewable energy project development throughout the region. Ted Kulongoski (D) reelected governor 51% to 42% over Republican challanger, Ron Saxton. 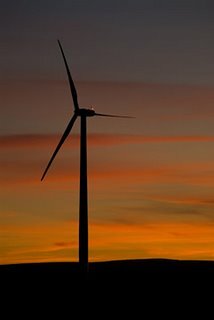 "[W]e ... need a strategy to make Oregon a national leader in alternative and renewable energy. I'm working on several fronts to achieve this goal. My proposal calls for 25 percent of Oregon's total electricity to come from renewable sources by 2025. A renewable energy portfolio has proved to spur renewable energy production, help the environment, and create family-wage jobs. Biofuels: My plan capitalizes on emerging "bio-energy" markets, particularly biodiesel and ethanol, to make Oregon a global leader in biofuel production. Conservation: Conservation is highly effective in reducing energy consumption. That's why I've more than tripled the state's flex, biofuel and alternative fuel vehicles and will continue to promote innovative technologies that provide savings and economic opportunities. Senator Maria Cantwell (D) was solidly reelected 57% to 39% over challanger Mike McGavick. Arizona Corporation Commissioner Kris Mayes (R) re-elected with 26% of vote (highest of five candidates; top two voter-getters take office). Boulder voters back carbon tax, 58% to 42%. Carbondale (Colo.) voters approve, 81% to 19%, a measure allowing the town to issue up to $1.8 million in Clean Renewable Energy Bonds to build and operate two large-scale solar systems. "I believe we can turn Nevada into an energy independent state. In Congress, I re-wrote the Geothermal Steam Act, essentially making it economically feasible to harvest one of our state's most abundant forms of energy. As governor, I would continue to make geothermal power, as well as solar and wind power, economically attractive. These clean energy sources would give Nevadans independence from other states and other countries that currently supply us. They would also stabilize our utility bills while those around us fluctuate with world events." Voters Make Their Voice Clear: We Want a Clean Energy Future! I'm sure that there are many more clean energy champions out there that I missed. I encourage any of you readers to mention them in comments here if you know of any other newly elected or reelected public servants that have pledged to work hard to promote a clean energy future at the local, state or national level. By supporting these candidates, voters across the West, and indeed across the United States, have made their voices clear in this election: we want representatives that will fight for clean, homegrown renewable energy that creates jobs here our communities, provides us with safer, more stable and more secure energy, and helps create a clean and healthy future for ourselves and our children! We'll need the hard work and support of all of these clean energy champions in the years ahead to craft smarty public policies that will help bring about the much-needed transition to a sustainable energy future! I'd encourage you to write letters to your own representatives to make sure they know you expect them to fight for a sustainble energy future. If they are one of these clean energy champions, they'll be glad to hear you reaffirm their stance, and if they aren't on this list, perhaps if they hear a call for clean energy from enough of their constituents, they'll be on this list next year!